Ceramic tray marked Coimbra Portugal. Interesting item. Most modern pottery from Coimbra appears to have a "date" giving the Century style the item is re creating. This tray does not have that mark type. 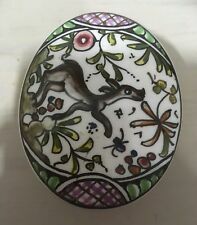 IN THE DEER & FLOWER PATTERN. 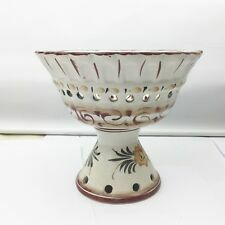 Vintage Coimbra Ceramics Hand-painted pink Tureen XVII Century Recreation. THE TUREEN IS 26 CM LONG HANDLE TO HANDLE. This piece is hand decorated in the manner of 17th century drawings and inspired by hunting scenes. THE PLATE IS 39 CM LONG BY 26 CM WIDE. Mix it with blue and white ceramics.Beautiful display piece. Original red and gold paper label attached to the lid which states “LF Lusofaianca Ceramica Artistica” and hand written on the base is “526/2 Lusofainca Hand Painted Coimbra Portugal Secixvii Carla Sofia”. 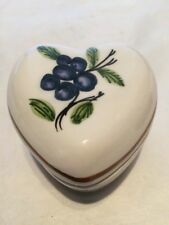 Genuine Coimbra Ceramica signed soup terrine, BASE ONLY. A lovely large Coimbra lidded spice or ginger jar, richly decorated, reproduction of a 17th century design, in really excellent condition. Height approx 6.5". Signed by Cris. Blue and white painted bird on plant, with flying birds above, with decorative edging. There are hanging holes to the rear as per the photos. I am not responsible for the sizes. I want you to be happy with your item so try to list any defects etc clearly. If item is not as described this is likely to be a mistake or oversight, I have no intention of making anything look/sound anything other than it is. 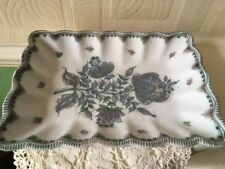 Small Hand Painted Oval Dish Marked Coimbra Portugal, White Ground - Very attractive, colourful floral design. Approx 16cm long and 3cm tall. Lovely ribbed sides.